ASUS today announced ProArt™ PQ22UC and ZenScreen™ Go MB16AP, slim and light portable monitors created for designers, video producers and other professionals who often need to create and showcase work away from the office. ProArt PQ22UC features an extremely high contrast ratio due to its OLED panel and exclusive ASUS ProArt Calibration technology for highly accurate, vibrant and undistorted colors. ZenScreen Go MB16AP can be connected to a laptop or Android™ device, and provides more flexibility with a built-in battery. 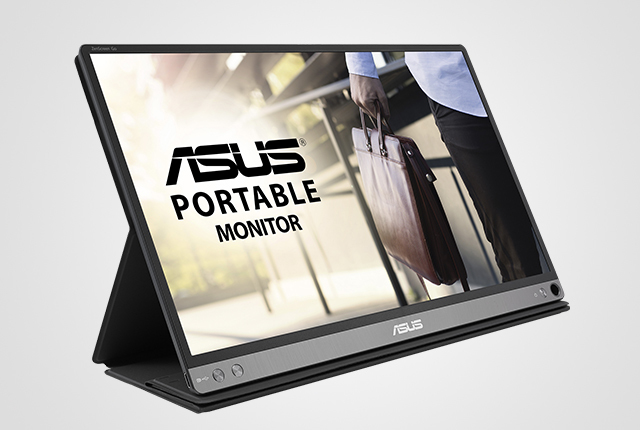 The new portable monitors will be on display at the ASUS Showcase Room at Wynn Las Vegas, from January 9–12, 2018. ProArt PQ22UC is the world’s first 21.6-inch OLED 4K UHD (3840 x 2160) monitor with 204 PPI and HDR support. The top-of-the-line OLED technology with pure RGB stripes ensures color purity, and allows PQ22UC to deliver extremely high color saturation with 99% DCI-P3 coverage for greater color accuracy. ProArt PQ22UC also features true 10-bit color depth, achieving a contrast ratio of 1,000,000:1 for darker blacks and brighter whites. With a response time of up to 0.1ms, ProArt PQ22UC is the fastest monitor in the market and delivers outstanding, blur-free performance when displaying videos and other animated content with fast action. And with HDR support, PQ22UC ensures HDR content can be created and displayed with consistently high quality, providing an unprecedented viewing experience. Just one third the weight of a conventional 22-inch monitor and offering an ultraslim profile, ProArt PQ22UC has a portable design that gives users an excellent way to showcase their work while on the go. Its detachable stand folds completely flat for easy transport, and the monitor can be set up in seconds without any tools. Paired with connectivity options such as USB Type-C™ (USB-C™) and Micro HDMI, ProArt PQ22UC is a highly convenient tool for professional designers and video producers looking to showcase their work anywhere, and in true 4K UHD resolution. Every ProArt PQ22UC is factory pre-calibrated to guarantee industry-leading color accuracy, ensuring all images are accurately reproduced onscreen. In addition, ProArt PQ22UC features exclusive ASUS ProArt™ Calibration Technology that ensures color accuracy even when the monitor is used with multiple computers and operational systems. ZenScreen Go MB16AP is the world’s thinnest and lightest Full HD (1920 x 1080) portable USB monitor with a built-in battery. Weighing just 900g and only 8mm thin, the 15.6-inch monitor is ideal for professionals on the go — whether when displaying mockups and slide decks or pitching a potential client outside the office. Featuring a built-in 7800mAh battery, ZenScreen Go MB16AP can be connected to any laptop or Android device without draining its power. ZenScreen Go MB16AP features a hybrid USB-C port that can be used for both video transmission and power delivery when its battery is running low — cutting down on the number of cables and giving users a neater work area. This hybrid solution is compatible with any PC with a USB-C or USB 3.0 port. ZenScreen Go MB16AP also includes an ultrathin 1mm foldable smart case that provides protection and can be turned into a horizontal or vertical stand. Alternatively, users can simply insert a pen into the hole located at the right bottom corner of the screen to prop it up. With outstanding design and engineering, ZenScreen Go MB16AP has been honored with a CES Innovation Award 2018. ZenScreen Go MB16AP features ASUS Eye Care Technology that includes Blue Light Filter and Flicker-Free technologies. Blue Light Filter reduces blue light by up to 70 percent, and features four filter settings that can be easily accessed via the onscreen display menu. Flicker-Free technology reduces flicker for a comfortable viewing experience. It helps minimize instances of eyestrain and other damaging ailments, and is beneficial for users who spend hours in front of a display.